You might remember that a few posts ago I wanted your opinions on which was the best setting spray to get. I had decided to pick up the Mac Fix+ when I got an email asking if I wanted to try a new setting spray; the Balance Me Skin Bright Toning Mist*. Of course I wanted to try this, because as well as acting as a toner and setting spray, it also has added skincare benefits that hydrate and plump the skin. Balance Me describe the facial mist as a 'non-drying, natural facial spritz with a sophisticated blend of super hydrating hydrating Hyaluronic Acid, balancing Chamomille Floral Water, revitalising Neroli and sophisticated Spikenard to offer skin an instant hit of moisture'. It also has added 'brightening Bergamot to leave complexions primed, plumped, replenished and dewy'. The Skin Bright Toning mist can be used in the various ways; as a toner over cleansed skin, to set makeup, to hydrate during the day and to refresh tired skin. It takes the concept of a standard skin mist and revitalises it! Not to mention the space and money saved from such a multi purpose product. The mist is also suitable to be used all year round, it helps to protect against dryness caused by hot climates, air conditioning, cold weather and central heating. I can imagine it's going to be really useful in Winter as I have the heaters on a lot and they can draw all the moisture out of your skin. So first of all, let me talk you though my experience of it. I was mainly interested in using this as a setting spray both underneath and on top of my base to give it that flawless look. So I would apply two sprays before I applied foundation to act as a primer, and then another two after I had applied foundation and any cream/liquid products. The nozzle is really easy to use and gives a good coverage used about half an armful away, the main thing is to try to position it towards the centre of your face. 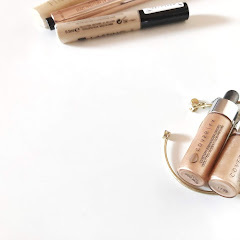 I found that foundation went really well over it (I used the Vichy 3D Correction see here), and it looked just as smooth as if I had applied my favourite L'Oreal primer. 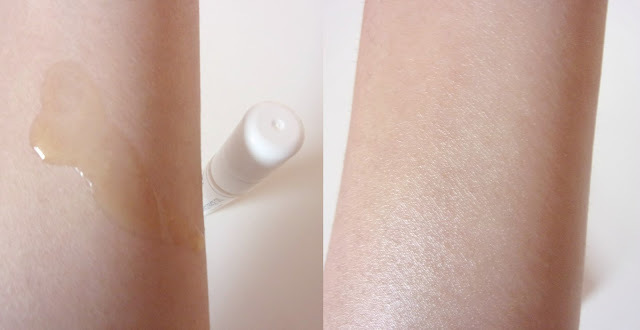 I then powdered the Vichy foundation to get rid of any excess shine and I then sprayed another two pumps which helped get rid of the powdered look and to give my skin more of a healthy glow. I must admit, I did think it was going to be quite dewy as that seems to be the trend lately. However, I think it gives more of a natural, radiant and subtle glow, than anything more on the shiny side. Although, my face is currently more shinier than natural but that's due to our late Summer. I'm not normally one for toners as I don't think they're absolutely necessary, but again I would prefer this over other toners as it doesn't have Alcohol in it (which is super drying for dry skin). 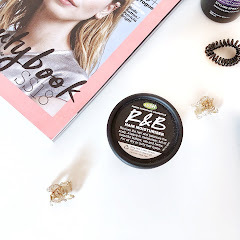 This also has no parabens, sulphates, petroleum, mineral oils, silicones, dea, pegs, propylene glycol, artificial fragrances and colours (what a mouthful!). I was using this over Eid as well. Eid, for me, is basically two things; lot's of makeup and lot's of food haha! Sometimes my base can start looking a bit tired if it's a long day so this really helped with breathing some life back into my foundation and skin. The skin mist is perfect for long occasions too as you can just pop it into your bag and go. The compact packaging makes it perfect for on the go, and it includes a decently sized 30ml. I wasn't really focusing on the longevity of my makeup as any of the products could have been affecting it, but it fared well throughout the day. The main reason I had initially wanted to purchase the Mac Fix+ was that you can use it with eyeshadows for a better colour pay off and finish. I decided to try this out with the Balance Me Skin Bright Toning Mist. I sprayed some of it onto an eyeshadow brush and then picked up a shimmery gold shade. It did infact work; the colour pay off was amazing and the shimmery shadow looked great! The only downside is that you might run out of the mist pretty quickly if you do this often. The formula of the Skin Bright Toning Mist is quite light, it looks like water but it's slightly bubbly. The droplets also feel quite fine when you dispense it. The packaging consists of a clear outer glass bottle, with a white coated container on the inside. Due to the inner container being painted white it will probably be hard to tell how much product you have left in the long term. For comparison, I also have the Jurlique Rosewater Balancing Mist (RRP £18) and the Love Your Skin London Floral Hydrating Spritzer (RRP £19.99). Whilst there is a lot of hype around the Jurlique mist especially, I didn't get on with these two. I thought they were over perfumed and didn't really make much of a difference. 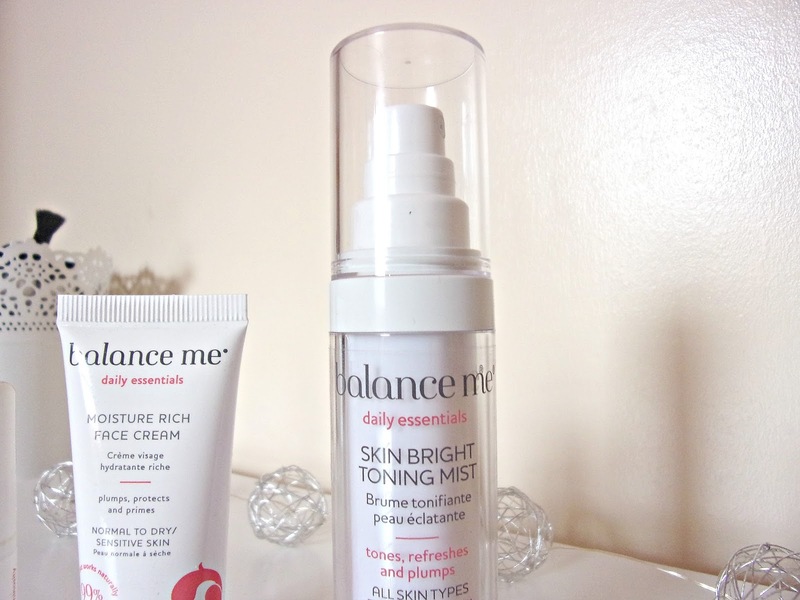 The Balance Me Mist has a much subtler scent, which disappears after application, and the results are also more long lasting. 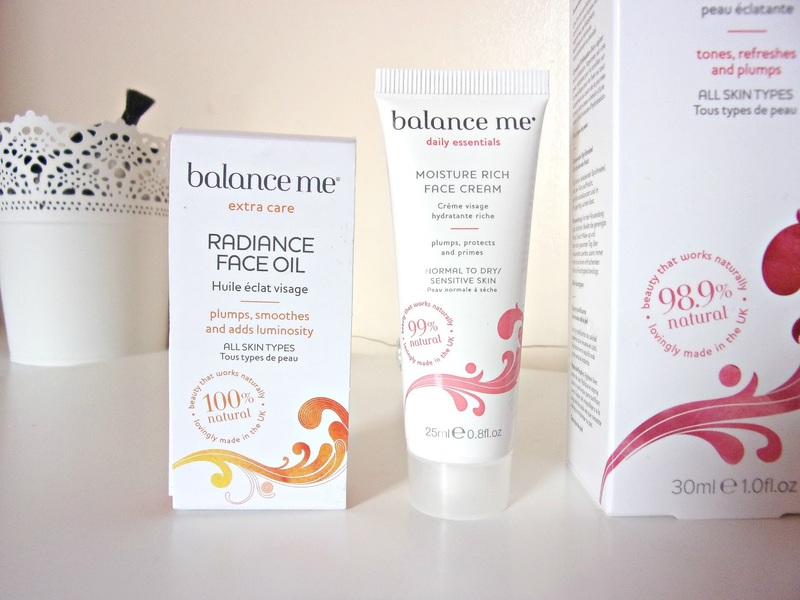 I was also sent some samples of the Moisture Rich Face Cream* and the Radiance Face Oil* to try. The Moisture Rich Face Cream is suitable for normal to dry and sensitive skin. It claims to treat and prevent dry patches and improve the skin's elasticity. The formula of the cream is on the rich side, as stated, however it sinks in well and you don't need much either. 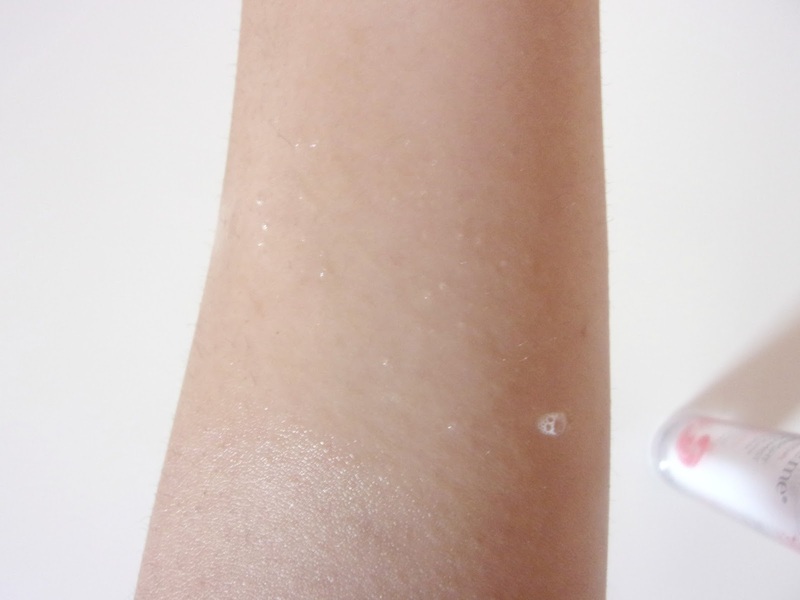 It really delivers for dry to very dry skin, as soon as I apply it I can feel the difference. My skin feels moisturised, soothed and hydrated, and it stays this way for the rest of the day. It is a bit tacky initially but it dies down to give a semi-matte finish. 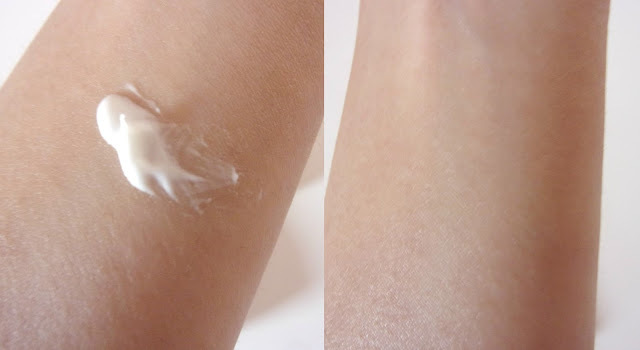 The cream does have a bit of a scent but it's not too strong, and it disappears once you've applied it. I will definitely look at purchasing a full size of this in Winter, it really does live up to it's claims and it's impressed me! The Radiance Face Oil is suitable for all skin types, and claims to deeply hydrate skin and reduce scarring and discolouration. The oil feels quite thin in consistency, however I didn't feel like it absorbed fully into the skin when applied. I initially used it during the night but I didn't wake up to deeply nourished skin like I was expecting, my skin wasn't drinking it up like I thought it would. 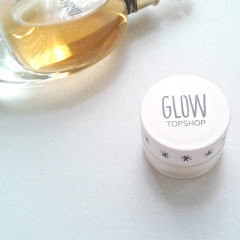 I then decided to try it out in the morning before my base and I think it can give a lovely glow under makeup. However, for me the scent is too powerful to try out the full size product. I'm not sure if this applies to face oils in general, because I tried one out in Boots to compare and that was quite strong too. Overall, I have really enjoyed trying out the Balance Me Skin Bright Toning Mist*. It's a great multi-purpose product. You can find it here online, or instore at John Lewis. It's more affordable at £12.50 compared to a lot of high end, and even some drugstore, setting sprays. 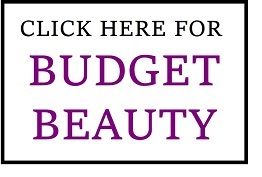 It's multiple uses also makes it a lot more budget friendly, and I would repurchase this if it runs out. 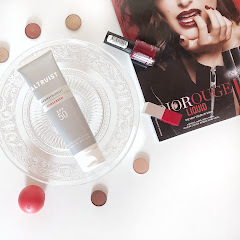 I also really like the Moisture Rich Face Cream, and I would really recommend it if you have dry skin and haven't found the right cream for you yet. What do you think of these Balance Me products? 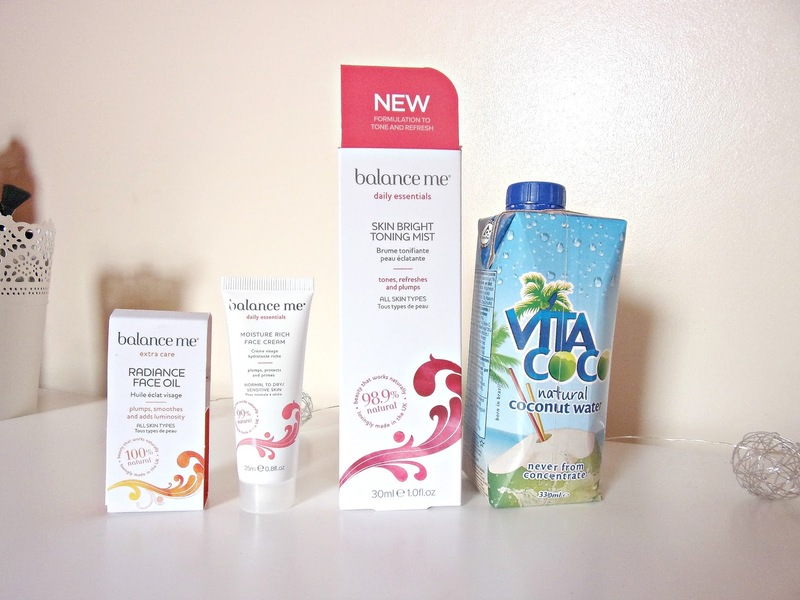 These products sounds really good, having dry skin i would love to try them. 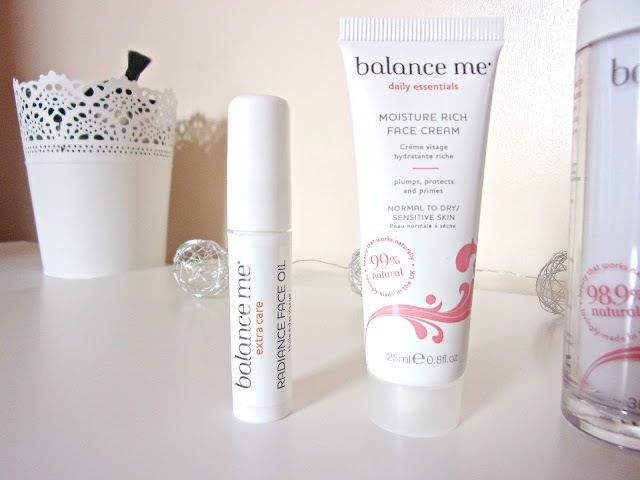 Aww, shame about the facial oil, that was the one that I had my eyes on. :-( Lots of facial oil takes time to absorb into the skin so what I do is damn my skin with a thermal water spray and then massage the oil into my skin. It absorbs way better that way! The mist sounds lovely! Anything with hyaluronic acid in gets my attention! I love mists and love the fact that you can use this to amp eyeshadow pigmentation! I need to try the mist as my skin is so dry, I think it will help. 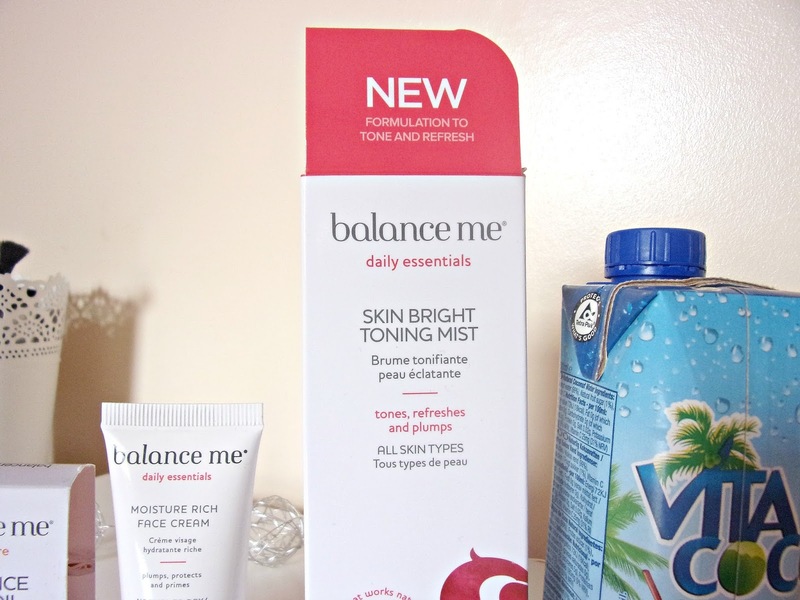 I haven't tried any balance me products, that toning mist sounds good. I have Fix+ and in summer when I use it as a finishing spray, it gets dewy after a few hours (damn oily skin) but I love how flawless my makeup looks. Ive not heard of this brand before so it was interesting to hear such indepth reviews about each of the products that you got! Sounds like I need to stay away from that oil! I love Balance Me. I got to meet one of the owners of the brand and she was such a sweet heart with so much knowledge. Made me love it even more! It's great that this gives more of a glow than a dewy finish :-) I always prefer that kind of product! 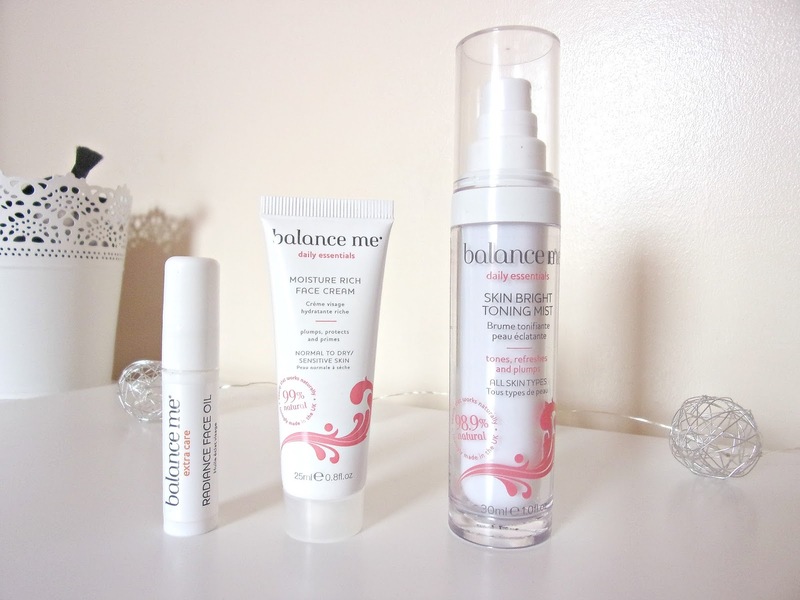 Ah this is such a lovely review - product looks lovely!! I find too many products have alcohol in them, even though it isn't needed, and it's just not that good for dry skin. Same here! I always wondered how Mists worked and if they actually work. I can't stand scented products, so it's nice to read that I'm not the only one who finds products that have a scent doesn't work for me! That sounds like a lovely experience! I've never heard of this brand before, so thanks for sharing!! These products sound ideal for my dry skin, I have seen hardly any setting sprays that offer skincare benefits as well so this sounds great! With this product I feel like you get SO much for your money! This is a brand I've just come across and I love it! I miss UK so much, looking at all your products. There are so many things I want to get from UK now haha.